The term FOUND ART (or READYMADE) describes art created from the use of objects that are not normally considered art. The idea of dignifying commonplace objects was started by Marcel Duchamp (1887-1968) who coined the term readymade to describe his found art. 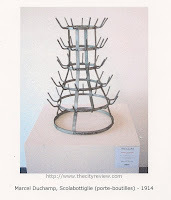 The Bottle Rack is a bottle drying rack signed by Duchamp in 1914 and it is considered to be the first “pure” readymade. It stands for the symbol of the tree. In our cellar you can find a bottle rack made in Arras (France) in the early 20th century which is very similar to the one signed by Marcel Duchamp. What a great coincidence! In the picture on the left you see our bottle rack, in the picture on the right the original one by Marcel Duchamp.